If you have a heart, “Fun Home’’ will break it. If you have a soul, “Fun Home’’ will touch it. And if you hunger for musicals that get under the skin rather than blandly skim the surface, you’ll want to hie yourself to the Boston Opera House pronto for the relatively short local run of this path-breaking, deeply humane, altogether exquisite work. Based on Alison Bechdel’s memoir in graphic-novel form and directed by Sam Gold, “Fun Home’’ retrospectively traces the complicated relationship between Bechdel, a proudly self-described “lesbian cartoonist,’’ and her closeted and tormented gay father, Bruce. He was killed during her first year in college when he was hit by a truck in what is depicted in the musical as a deliberate act of suicide. Now nearly the same age as he was when he died, the Alison of “Fun Home’’ (well played by Kate Shindle) is trying to understand why he killed himself, how much or how little father and daughter ultimately had in common, and who he really was. 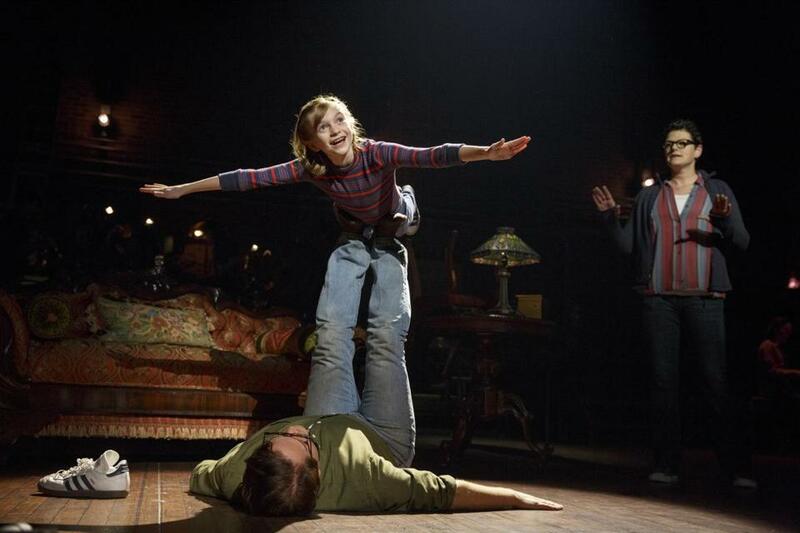 As a fundamentally small-scale work, “Fun Home’’ suffers somewhat in its transition from the in-the-round configuration of New York’s Circle in the Square Theatre. A certain degree of intimacy is lost on the Opera House’s proscenium stage; that sensation of feeling uncomfortably close to a family as it steadily disintegrates is diminished. But that doesn’t keep this production from being a deeply moving, sometimes overwhelming experience. Susan Moniz, who portrays Alison’s mother, Helen, delivers a quietly shattering “Days and Days,’’ adding up the ways her life disappeared beneath her. Carly Gold portrays Alison as a 9-year-old girl (called Small Alison in the script), and Abby Corrigan plays her as a college student (Medium Alison). Gold does a beautiful job throughout, especially in her shiver-inducing rendition of “Ring of Keys,’’ in which the child experiences the first stirrings of understanding as she feels instant kinship with a butch delivery woman at a diner. Corrigan, meanwhile, captures perfectly the endearing awkwardness of college-aged Alison as she embraces her awakening sexuality, then celebrates it in the funny, heartfelt “Changing My Major,’’ sung to her sleeping girlfriend, Joan (Victoria Janicki). But the success of “Fun Home’’ hinges on the actor who plays Bruce. Robert Petkoff does an admirable job filling the big shoes of Michael Cerveris, who played the role on Broadway. From start to finish, “Fun Home’’ stands as exhilarating proof of the artistic heights that can be reached if committed artists are willing to dig deep into the complexity of human emotion.